Prehnite is found in South Africa, China, Australia, Scotland and New Jersey, USA. The stone was said to be discovered in South Africa by Colonel Hendricks Von Prehn, a mineralogist. Prehnite is a calcium aluminum silicate stone with an orthorhombic crystal structure. It is commonly found in large granular habits but is also found in prismatic or pyramidal form. It’s color is a Venutian pale-green, but is also found in yellow, white or gray structures. One will immediately feel a sense of relaxation both mentally and physically whilst looking at this stones gentle color vibration. Prehnite is a stone of communication with higher beings such as angels, faeries, ET’s and our higher selves. It specializes in unifying the heart and the will so that one’s power is being used to carry out the highest good. When the heart and the will come together for the service of love, we begin to raise our personal vibration. This stone quiets restlessness and brings peace out of worry and stress. Prehnite helps one to embrace the present moment so that they can create their future in a positive way. When the imagination is starting to wander or create negative thoughts, Prehnite will wash these thoughts away and return us to the present. This stone is constantly reminding us to use our imaginations for the good of all and in resonance with the hearts desires. Prehnite has a profound effect on both the solar plexus and heart chakra. These two chakras play a huge role in the higher communication that Prehnite provides. Beings from other dimensions respond strongly to the amplification of the heart chakra that Prehnite nurtures.The electromagnetic field of the heart can be seen and felt by these beings- making this stone an excellent choice for those seeking guidance from the higher realms. In other words, Prehnite expands the hearts aura sending out a large-scale broadcast for non-physical beings. Meditating with this stone will bring messages from angels and guidance from spirit beings. Keeping Prehnite around will increase accuracy in psychic readings, enhance intuition and allow one to surrender spiritually. 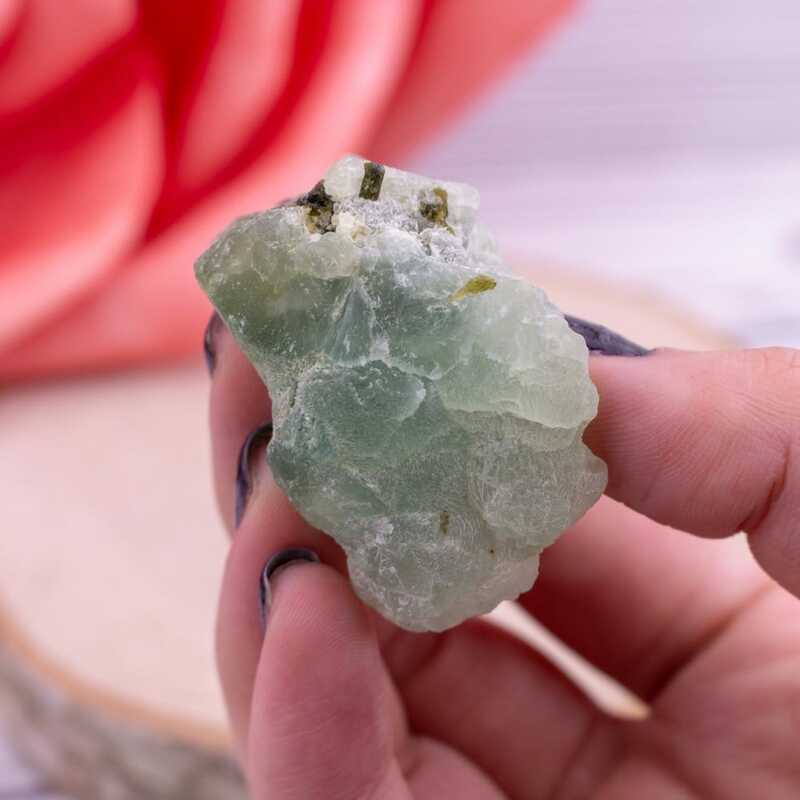 Because Prehnite is ruled by the elements of Earth and Water, it allows one to stay grounded into the essence of Earth while providing a cooling antidote for the fiery emotions and nervousness. Peace and calm emulate from the stones energy field and allows a sense of clarity when working from the heart-space.